We are welcoming Owen Laverty as a Keynote Presenter at the upcoming event – DLR’s Digital Transformation Summit on 13th June, 2019. Owen Laverty is the Head of Enterprise and Economics in Dun Laoghaire-Rathdown County Council. His responsibilities vary from investing in early stage or smaller SMEs, to improving and promoting the economic development of the region. DLR County Council is one of the four councils in the Dublin region. DLR County Council offer services like Local Enterprise Development, Grant Schemes, DLR Tourism Development, Environment & Climate Change, Planning and many more services in the DLR region. LEO (Local Enterprise Office) supports the regional businesses primarily through the provision of training, networking opportunities and funding. They recently completed a very successful Enterprise Week with over 20 events bringing in the best global speakers on subjects from pricing and selling to mega trends and branding. At the upcoming event on 13th June, 2019, Owen Laverty is a Keynote Speaker. Owen will be highlighting the benefits of placing Productivity at the centre of any business and why is it a key factor to the survival and growth of a business. Putting productivity at the centre of any business is key to survival and growth. Highlighting the productivity gap between bigger organisations and smaller organisations and how these can be reduced. How the Local Enterprise Office can support companies looking to become more efficient. DLR’s Digital Transformation Summit is an annual event that focuses on helping small and medium size businesses to grow through Digital Transformation. This year the event will happen on 13th June at Dun Laoghaire’s landmark building – Royal Marine Hotel. After delivering successful events in the past two years, this will be the 3rd Digital Transformation Summit. It is an ideal event to learn, network and transform your company to meet the demands of the 21st century. This year the theme of the conference is productivity through digitalisation. You will learn how you and your business can be more productive, save time and efficiently utilise resources. This conference has been designed to assist business leaders, decision makers, startups, entrepreneurs and thought leaders in navigating a successful path to digital success. 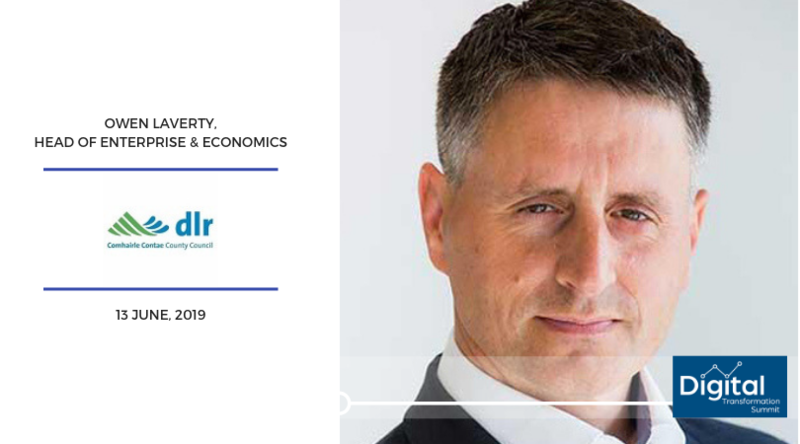 DLR Summit will help you to understand how you can continue to transform your business to take advantage of the ever-dynamic digital changes that are effecting Irish and Global economic and social structures. We have secured some of the most forward thinking online strategists and implementers of digital transformation. If you are going to keep ahead of your competitors, then these are the people that you want to learn from.